The Hobhouse Report is a document concerning the state of rights of way in the UK. Written by Somerset District Councillor Henry Hobhouse, the report highlights both good and bad features of public footpaths in the UK, plus suggestions for changes. 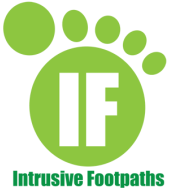 We at Intrusive Footpaths recommend it as a comprehensive assessment of footpath law in our country. This is the Application Pack for the Vale of Glamorgan. Each local authority(LA) will have its own procedures and may or may not have an application pack. Ask your LA if it has a procedure and/or an Application Pack. Your diversion issue MAY be governed by section 119 of the Highways Act 1980 so do your research - if possible get a professional legal opinion. This is a summary of relevant items that have been made available to all interested parties. Read details of the latest experiences of homeowners who have a footpath through their home. Survey of Family Homes Experiences of a Footpath.